^ Konya, Jozsef. Nuclear and Radiochemistry. Elsevier. 2012: 74. ISBN 9780123914873. ^ Barabash, A. S. Experiment double beta decay: Historical review of 75 years of research. 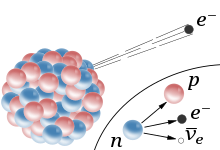 Physics of Atomic Nuclei. 2011-04-01, 74 (4): 603–613. ISSN 1063-7788. doi:10.1134/s1063778811030070.